In Vegas Downtown Blackjack, count on the dealer hitting on all soft 17s. You can split, and can re-split twice, for a total of 4 hands. Aces can be re-split, but split aces just take one more card before you are forced to stand. Ten point cards dealt onto split aces give you 21, not blackjack. You can double down at a cost of 1x your initial bet, even after a split, but never after you are dealt a blackjack. Insurance is available, but you do not have the choice to surrender. The maximum initial wager you are allowed to make in the game of Vegas Downtown Blackjack is 200 GBP/Euro/USD, and the minimum possible wager is 1 GBP/Euro/USD. Wagers are made using a variety of chips, which come in 10 different denominations – this lets you bet exactly how much you want to with every hand. The payout for blackjack is the standard 3:2. The payout for insurance is the standard 2:1. For a standard win against the dealer, you are paid out at 1:1. Microgaming’s table games never disappoint in this department, and Vegas Downtown Blackjack is no exception! 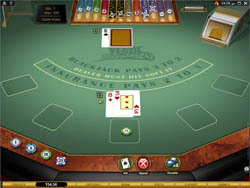 The top-down view (angled view on Vegas Downtown Blackjack Gold) is not quite realistic, but it gives you a great overview of the whole table, and it is easy to see exactly what is happening at any point in the game. The bold, colorful graphics (small animations in the Gold version) are easy on the eyes, and there is nothing flashy to distract from playing. Gameplay is great too, with big buttons and a very intuitive, easy to navigate interface system. Overall, this game gets five stars for this category! Don’t just split on a whim – follow a specific strategy. Here is some advice you might choose to follow when splitting. Never split 4’s, 5’s or 10’s, and always split aces and 8’s. As for the rest of the pairs you can get, only split those if the dealer’s face up card is 6 or less, otherwise leave them be and just play the hand. These are not strict rules, but guidelines to help you figure out what to do. Good luck! Vegas Downtown Blackjack is classic, casino-style blackjack at its best. With just two decks, you can practice your basic strategies here, and maybe win big! This game looks and feels quite natural, and it’s easy to forget you’re playing on a computer when you’re 30 minutes into a heated game. The only thing missing here are the crowds!